After mysteriously disappearing for two years with her best friend, young Judith returns home alone violently maimed. Her inability to communicate with her voice soon makes her the pariah of the community and the victim of cruel gossip. Judith herself is unsure about the details of her disappearance, and she moves through life silently pining for the boy she loves. Rejected by those around her, Judith struggles to appease her domineering mother and avoid confrontation with her tormenters. When her village is threatened by the return of a former enemy, Judith must recall painful memories and enlist the help of an unlikely ally. As one danger is averted, another soon takes its place. Judith finds herself stalked by a mysterious adversary. With the help of an unlikely friend, Judith must find her voice and reveal the truth of her disappearance and maiming before it’s too late to save her own life. This is an incredibly powerful narrative told through the perspective of the mute girl, Judith. Although the choppy writing style is at first difficult to follow, it eventually develops a sort of natural cadence that really draws the reader in. The reader is at first given a narrow glimpse of Judith’s life and experiences, and then this glimpse is broadened to reveal the truth about her horrific maiming. Admittedly the truth about Judith’s experiences is surprising, and Berry does an excellent job revealing the true nature and motives of various characters. The reader really gets the impression that people are not often what they portray themselves to be. The abuse that Judith receives after her return to the village is greatly disheartening, but the resilience that Judith displays is inspiring. Teen readers may relate to Judith’s experiences to some extent, and her ultimate triumph leaves the reader with a sense of hope for the future. Reader’s Annotation: After a terrible maiming, Judith is left mute and afraid. To save herself and the boy she loves, she will be forced to confront painful truths and find her voice. After having four children with her husband, Phil, the author states: “I went back to school and earned an M.F.A. in writing for children and young adults from Vermont College of the Fine Arts, where I learned from many talented and committed writers for young people. The Amaranth Enchantment was the second novel I wrote in school, and the first one to sell to a publisher. Since then I’ve written Secondhand Charm, All the Truth That’s In Me, and the Splurch Academy for Disruptive Boys series with my older sister, Sally Faye Gardner, as the illustrator. 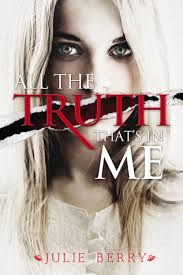 All the Truth That’s In Me, my first YA novel, is my most recent release. It’s a 2013 Horn Book Fanfare title, a School Library Journal Best of 2013 book, and a Kirkus Best Teen Read for 2013. It has been named a Junior Library Guild Selection and has been nominated for a Carnegie Medal and a YALSA Best Fiction for Young Adults award, and will be published in 12 countries internationally. Have listeners attempt to talk without the use of their tongue, and then relate it to Judith’s situation. Describe Lucas through Judith’s eyes. Justification of Selection: Aside from being an assigned reading, this book has a strong female protagonist who demonstrates an inspiring resilience and perseverance through adversity.